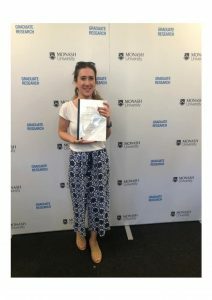 Home/BioPRIA News/First PhD thesis submission for this year! Congratulations to Aysu Onur for submitting her PhD thesis. Aysu’s project is a part of Graduate Research Industry Partnership (GRIP) program and supported by 3M Australia. Her research involves development of novel cellulose fibre composites via papermaking technique for purification in food and beverage industries. Best wishes for her next journey!